Click here to see their calendar. To learn more, visit their website. To plan your visit click here for a link to the FAQ page. Buy your tickets online & save. This place is great for both family and friends! I’ve been their twice with my kids and the last time with friends. It offers a ton of things for kids (I recommend the fort) and the Bastrop brewery even has a setup for the adults. We love Barton Hill Farms. We arrived at the farm late one Saturday afternoon and found a parking spot easily in the large field which serves as their parking lot. 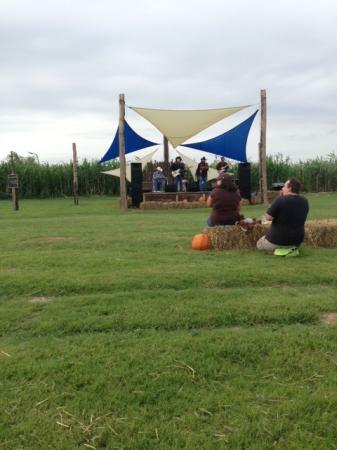 The farm is beautiful; lush green grass, hay bales and pumpkins everywhere which makes it really feel like fall when you're there(even in Texas). 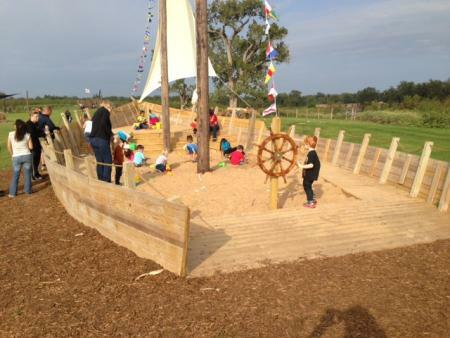 Both of my children made a mad dash to the pirate ship which has a sand box in the bottom of it. When I was able to tear them away from the sandbox they also loved climbing on the hay bale pyramids and playing in the fort. Because we arrived later in the day we missed all of the activities which took place from 11am-2:30pm but they included pumpkin painting and carving, sac races, a washer tournament and face painting. They also had two corn hole games set up for people to play. One of my favorite things were the hay bale swings which hung from several of the trees on the property. I didn't see a pumpkin patch although I saw several people carrying pumpkins. I emailed the farm and was told they would have their official pumpkin patch with a cashier up and running the weekend of 10/13. It was getting a little late when we were wrapping things up so we skipped the corn maze. We're going back with some friends in a few weeks and I look forward to trying it. 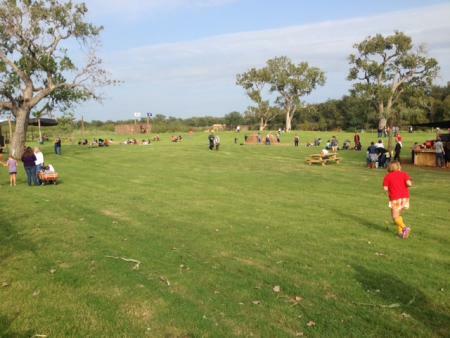 It's 5 acres so you may want to bring a wagon or stroller for younger children to enjoy. They have a snack trailer with food from Bastrop Brewery with things like pretzel wrapped vegan italian sausage, BBQ chicken sliders, pulled pork sliders, jumbo pretzels, ice cream, chips and water. There is another concession stand which serves juice, water, various teas, as well as beer from the Bastrop Brewhouse, Texas wine and there's a kettle corn stand. It might seem a little on the pricey side. We paid $27 for 2 adults and one child(our youngest is under two so she got in for free). But if you're planning on spending a good amount of time there and taking advantage of the activities they offer it's worth it. If you're just stopping by it might be something to consider. I still think it's worth a visit. It's really just a fun, relaxing way to spend a fall day. They have lots of picnic tables where people can sit but you can also bring a blanket and a few chairs and sit on the lawn, enjoy the music, grab a drink or a snack and spend time with your family. Some of the picnic table areas are covered so you can get out of the sun on a warmer day if you needed to.